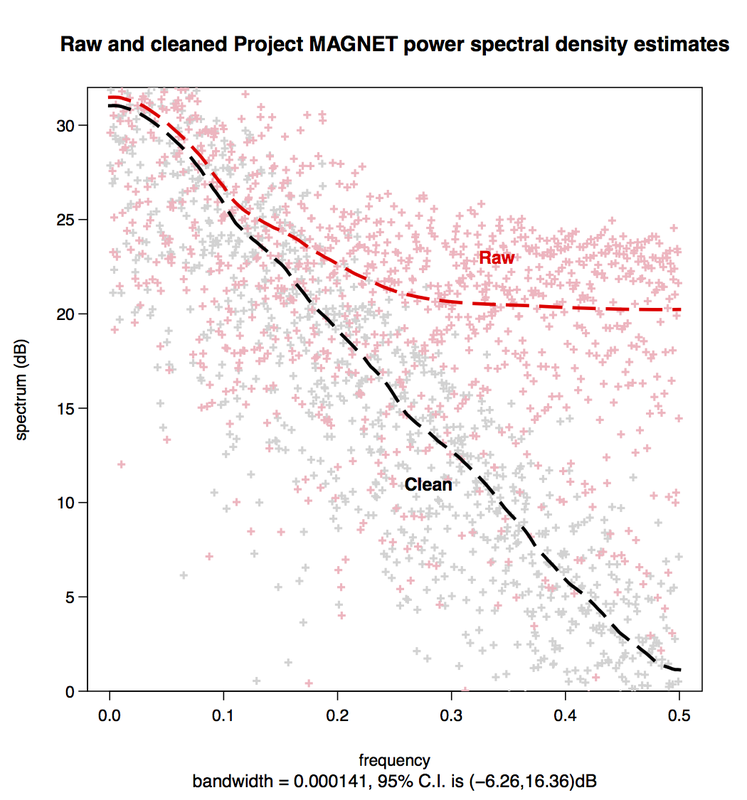 Power spectral density estimates of the Project MAGNET dataset from psd::pspectrum (lines), compared to those from stats::spectrum (points). I’m pleased to announce psd 1.0, a long-overdue major update from the 0. * series which includes significant advancements in performance, improved clarity and consistency of documentation and method/class handling, and the elimination a few long-standing bugs. Most importantly, all major bottlenecks have been eliminated with new c++ codes: the adaptive method is much faster now. Thanks to Dirk, Romain, and any other Rcpp (and RcppArmadillo) contributors for building such a fantastic package! Unit testing: I’ve put in place the framework for unit-testing with testthat; so far there are only a few tests, but I’ll be adding more in the future. Thanks to Hadley and RStudio crew for yet another fantastic package! Dependency on fftw dropped: it’s been a frustrating process trying to ensure that the fftw dependency would be satisfied — my requests have generally fallen on deaf ears — so I dropped it; instead psd now uses good ole’ stats::fft, despite the speed disadvantage for very long timeseries. I justify this by noting the dramatic speed increases afforded by the new c++ code, and that only a single DFT needs to be calculated during the adaptive procedure. Loss of some backwards compatibility: unfortunately I’ve been unable to reconcile changes with the silly things I built into the original versions, so you may find that scripts written for 0.4. * fail — if this is a major issue feel free to get in touch with me and hopefully we can straighten things out. Please submit Issues/Requests through github. And, as always, I’m happy to supply a reprint of the journal article accompanying the package. To leave a comment for the author, please follow the link and comment on their blog: The Geokook. » R.